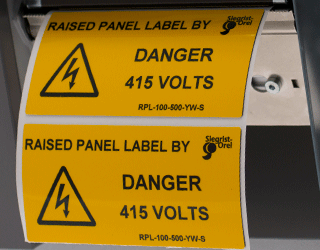 RPC (Raised Panel) Labels are innovative labels specifically designed to replace engraved and plotted plates for the identification of electrical components, electrical cabinets, push button, patch panels, etc. RPC labels save time and money by allowing you to print name plates exactly when you want them rather than having to order pre-printed name plates and holding stock. This process is a least 7 to 10 times faster than engraving and delivers up to 50 percent cost reduction. RPC labels differ from the RPL labels due to the absence of the foam layer, allowing low profile asset or instruction marking in space restricted areas. RPC labels also benefit from Low Fire Hazard adhesive layer.